Don’t forget the cranberries for your Thanksgiving dinner! Our cooks have been busy stirring up batches of our Ruby Red Cranberry Sauce with its simple, but delicious orange and cinnamon flavours. Our cranberry sauce tastes great with our chicken and beef pies and of course turkey. 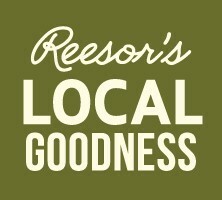 Ruby Red Cranberry Sauce is available at Reesor Farm Market and at Reesor’s Market & Bakery.